By default the WP Security Audit Log plugin keeps a record of all the changes WordPress user with any role do on a website or multisite network. 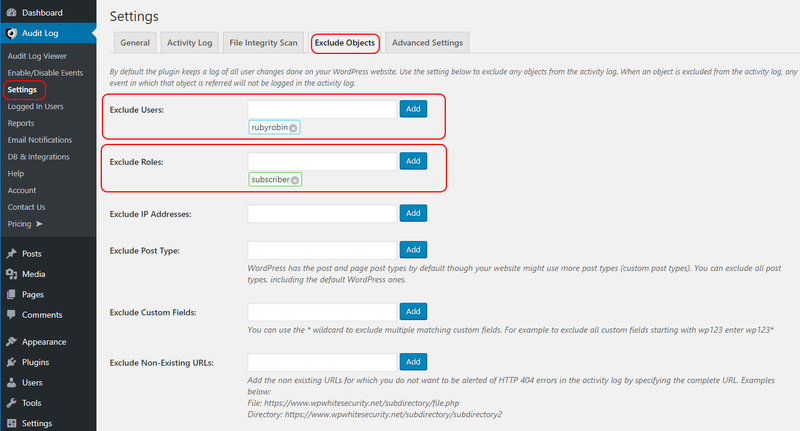 Though it is possible to exclude either a specific WordPress user, or users with a specific role from the activity log. When you exclude a user or a role, the changes that such user (or users with the excluded role) do on WordPress will not be recorded in the WordPress activity log (audit trail). To exclude a user or a role navigate to the WP Security Audit Log plugin Settings, click the Exclude Objects tab and specify either a user or role. Click Add to add the user or role and once ready with the changes click Save to save the plugin’s settings. The below screenshot highlights the exclusion settings in the WP Security Audit Log plugin.